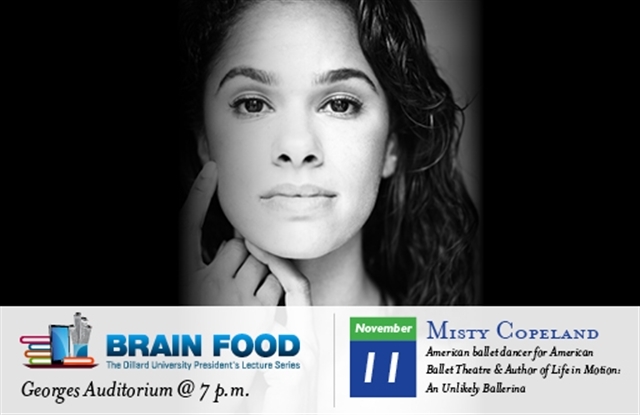 (New Orleans) – On Tuesday, Nov. 11, Misty Copeland, ballet soloist with the American Ballet Theater and author of Life in Motion, will deliver the next Brain Food lecture in Georges Auditorium at 7 p.m. on Dillard’s campus. A book signing will follow the lecture. The event is free and open to the public. Although Copeland began ballet at the late age of 13, she has excelled and had unprecedented success in her art. At 15, she won first place in the Music Center Spotlight Awards. She studied at the San Francisco Ballet School, American Ballet Theatre's Summer Intensive, on full scholarship and was named American Ballet Theater’s National Coca-Cola Scholar in 2000. Copeland joined American Ballet Theater’s Studio Company in September 2000, joined American Ballet Theatre as a member of the corps de ballet in April 2001 and in 2007 made history by becoming their third African American Female Soloist and first in two decades. December of 2014, Copeland is slated to perform the lead role of Clara in American Ballet Theatre’s production of The Nutcracker. Copeland is passionate about giving back and has worked with charitable organizations in mentoring young girls and boys. In 2012, she was inducted into the National Boys & Girls Club Hall of Fame and received the “Breakthrough Award” from the Council of Urban Professionals that same year. She is author of two books, the New York Times Bestselling memoir, Life in Motion, co-written with award-winning journalist Charisse Jones and a picture book, Firebird, in collaboration with award-winning illustrator and author Christopher Myers. Both books were published in 2014. Seats are on a first come basis. For more information go to @BrainFood, visit www.dillard.edu or call (504) 816-4800.